Getting two dogs at the same time seems like a great idea. Dogs are social animals, and a dog who will be alone all day can easily turn to destructive behavior or become anxious. Two puppies can entertain each other and keep each other company. So, what’s the problem with bringing home two puppies at once? Professional trainers like myself recommend against getting bringing home two puppies. While this sounds like a good plan in theory, in practice it often causes quite a bit of heartache and trouble. In addition to the problems one might expect with bringing home siblings such as double food and vet costs and double the potty training work, we need to focus on how the puppies will develop. Puppies’ brains continue developing until they hit sexual maturity (and even a bit beyond that), and there’s some convincing research out there that bringing two puppies home at the same time prevents one of the puppies from reaching his or her full potential. Luckily for us, this topic has been researched extensively by someone who knows all about creating behaviorally sound puppies: guide dog organizations. One of the biggest problems that guide dog organizations run into is that puppy raisers are hard to come by. Puppy raisers are families who agree to raise future guide dog puppies, socializing them and teaching them basic obedience. This isn’t an easy job, and the emotional impact of giving up their puppies after a year of bonding and hard work means that many families are reluctant to repeat the experience. In order to maximize the use of their volunteer puppy raisers, one guide dog organization decided to try an experiment. Willing homes were given not one, but two puppies to raise, thereby doubling the number of puppies the guide dog organization could work with. Puppies born to these organizations are tested before being placed and are tracked throughout their growth and development. What the organization found was startling. Placing two puppies in the same household always caused one puppy to become temperamentally unsuitable for work, even when both puppies started off as perfect candidates. When two puppies are placed together, they learn to rely on each other. One of the puppies always becomes shy, even when both puppies started off as bold and outgoing. This is a huge problem, since it means that the shy puppy never reaches his or her potential. In fact, this was such a major issue that the guide dog experiment was quickly halted, and to this day guide dog organizations only place one puppy at a time in puppy raisers’ homes, even when the homes are highly experienced. In addition to one puppy becoming shy, there are other behavioral implications for two puppies who are adopted at the same time. Oftentimes even the “bold” puppy turns out to be quite nervous and uncertain when separated from his or her littermate. Furthermore, the puppies frequently become incredibly co-dependent, exhibiting heartbreaking anxiety when separated from one another. They often fail to bond to their human family as strongly as they otherwise would, or sometimes at all. At social maturity, these puppies may begin fighting with one another, sometimes quite severely. Even puppies who are not related can exhibit littermate syndrome when placed together. Professional trainers recommend against getting two puppies within six months of one another, because the risks are just too high. This doesn’t even take into consideration the other practical considerations, such as the increased costs of vet care, food, supplies, and training; the extra work of training and caring for two dogs; or the time requirements of two active puppies. Can littermate syndrome be prevented? Theoretically, yes, however it’s so difficult as to be nearly impossible in practice. Remember, even experienced guide dog puppy raisers aren’t expected to be able to prevent this issue from developing. At a bare minimum, the two puppies would need to be crated and cared for separately, including separate walks, training classes, and playtime with their owners. The puppies need to have more one-on-one time with their new owners than they have with each other, effectively doubling the work and negating any of the possible benefits (i.e. companionship) that they were adopted together for in the first place. The bottom line is that puppies do best when brought home separately. If you want multiple dogs, consider purchasing or adopting adult dogs who are already done developing instead. Great info! Thanks for sharing!! information like this should really be stickied here on DT. so many need to read it. Location: Trancendental plane of awesome. I think it should be stickied as well. It's amazing how many people think they're doing the right thing by their puppy by getting a sibling with it. I had always heard it was good to get two puppies at the same time so they wouldn't be lonely. However, after working with many dogs that are siblings during grooming I have absolutely seen some of these issues first hand. I've yet to see a set of littermates where at least one wasn't somewhat neurotic.. especially when separated from their sibling. Great article! More like this need to be 'stickyed' on here. Its side though that despite someone reading this and us telling them about this and other studies, they can read this article and think "Oh, that won't happen to me!" Hopefully it'll help others though! OMG I just read the article and never occured to me I would experience same problems. 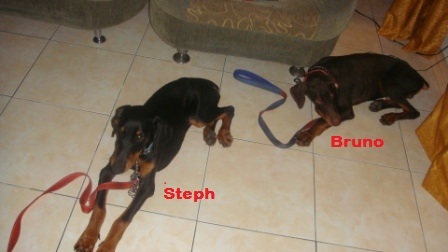 I just got 2 litters - steph n bruno, both 5 months old and are more than a month with me now. They are showing agression when they are walked together, sometimes barking at each other at a distance. Fighting happens once in a while. They are in separate cages but they can see each other. 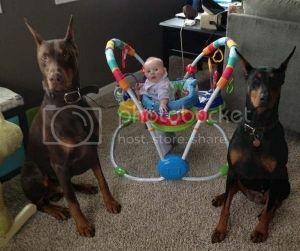 The male dobe shows aggression and dominance. 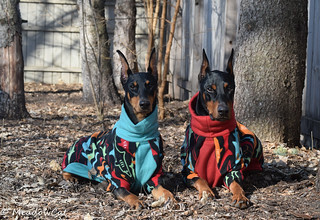 The female litter is more submissive and restive compared to the male dobe. I know I got the puppies too late (5 months and ears not cropped) but I'm beginning to wonder if I will proceed having them together. The first 3 days was a nightmare - we couldnt sleep due to the male litter's excessive barking. It's more contain now. After reading this article - I should perhaps decide soonest. The breeder wasn't aware too. I beginning to love them both, especially the male litter, Bruno. Aren't they adorable? Huhuhu. Dogs Name: Bruda Weekend Warrior, aka "Rowan"; Bruda Pure Seduction, aka "Monroe"
Great article...thanks! I think I will share with my foster group. UKC Ch. Bruda Weekend Warrior, RN TT CGC TDI "Rowan"
Bruda Pure Seduction, S.T.A.R. Puppy "Monroe"
Seems like this thread needs a bump today. Great article MeadowCat, an easy read that makes total sense. Several years ago, I trained 2 boxer pups once a week from 8 weeks old, for less than a few months, instilling off-leash perimeter control & general commands - one pup was actually their sons, and was there most of the time. The couple was a dog food customer of mine, so for the next few years I got to see the adult dog interactions, in the family house. Somewhat neurotic...always came into my mind when I entered their front door, and saw the big dogs. I though the two would quickly drive me nuts - littermates...no thanks. Last edited by Beaumont67; 02-24-2013 at 09:03 AM. Love this. As a dog trainer I have always been against people getting litter mates (nightmare from day one IMO). Nice to see some others believe it too. Thank you for such valuable info. Hopefully, people will read and take into consideration. I have learned so much on DT, and appreciate articles like this one. Can someone give me honest advice?.. It seems like for some reason it's '2 pup craziness' around me.. I know 3 families who got to pups at once! 1 having two rotties for a while now (they are realtives of my bf so I don't evene want to say anything not to sound rude..). Another reatives of my bf JUST got two labrador mix girls of around 8-9 weeks..
And one client very nice girl, who bred her Dogo Bordo and decided to keep 2 boys from the litter (they are around 10 weeks now)..
- advice to get rid of one pup.. I more care about the girl as she is very nice person and she has GSD girl and mum of two pups and a kid of herself.. It's not realy my business, but I prefer to be helpfull when I can to nice people. Bf's relatives are a bit on a difficult side.. I am sure I am in the minority here, but, raising two puppies even littermates is possible. 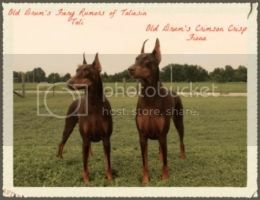 Before I even heard of Doberman Talk, I made not one but two major mistakes. I bought a brother and sister from a byb because I didn't have the heart to leave them in the awwterrible conditions they were in. Granted it requires a lot of patience and individual work with each dog but so far knock on wood my two are doing pretty well. At 20 months, my boy is more outgoing with strangers but my girl is confident just a little more reserved. After a few minutes she comes around. I don't see either of them being more developed than the other. Of course I am not saying this is the ideal situation for everyone just saying it can work if you put the time and effort into it. Last edited by pgh dobelady; 12-23-2014 at 11:50 PM. I don't think anyone said it wasn't "possible" however it is nowhere near ideal and most people make many many mistakes at the expense of the dog(s). the biggest issue I see is they are too closely bonded and can't be without each other. I do admit my two are very closely bonded but they are equally bonded to me and to other family members. Also they seem to enjoy one on one time with me and away from one another as well. Who knows maybe one day I may have a huge problem on my hands. I am just speaking in the here and now. As l said I did this before I joined the forum but it was too late to do anything other than make the best of it. Trainers and rescues often see the end result of this and a puppy/dog who has HUGE issues. Not saying this is you situation per se. But once the situation is crated, it's awful for the dogs to break the cycle. They scream, cry, break things, hurt themselves, bark etc if left alone and sometimes totally shut down. Because it CAN be such a big issue is why I don't recommend it. It's not like an easier bad habit to fix (say jumping). I think you will have a hard time talking either of them into giving up a puppy they already have. I don't think there's anything you can do at this point. Just want to get some more advice. Got 2 puppies 1 week apart. Rocky is 7 weeks and Bella is 8 weeks. They are from different litters. I never knew there was such a thing as littermate syndrome, I though it would be nice for Bella to have another puppy to play with. They do seem fine for the moment. Bella was just a serious ball of energy the night Rocky arrived. But after that they seem normal. They usually go their seperate route and play in different parts of the house. What can I do to ensure that they don't get too attached. We do play and feed them seperately. Dogs Name: Looking around for potential breeders and upcoming litters.